This article is part 3 of a series on peak oil in the South China Sea. Exxon’s work is focused on a field in undisputed territory about 80 kilometers (50 miles) offshore from central Vietnam, spokesman Aaron Stryk said in response to e-mailed questions. He declined to comment on reports China warned Exxon against exploring in disputed areas. For the last 10 years monthly crude production gyrated between 300 kb/d and 350 kb/d. Fig 2: Post peak oil traffic in Vietnam (90 million population). While gas production increased. Gas is mainly used for power generation and the chemical industry. We can see that this impressive growth has been achieved by adding more and more fields, especially in the Vietnam-Malay CAA basin (PM-3) and the Cuu Long basin (Hai Thach). But the graph also shows the decline in the Nam Con Son basin (blocks 11.2 and 6.1) reflecting the endless battle against depletion. In 2010, as gas production had reached yet another peak, the CEO of PetroVietnam, Dr P. Dinh Thuc, did a slide show for the World National Oil Companies Congress in London, showing gas demand going up to almost 25 bn m3 pa, but production peaking at 14 bn m3 pa in 2018. Reality so far was much less. 3 kb/d of liquids is a minute amount and 375 Mcfd is just 0.04% of Vietnam’s current demand. Apparently this is just some further testing. The [PetroVietnam] chairman also asked ExxonMobil to use its advanced technologies to effectively produce the project’s gas, which has a high CO2 content, and look for ways to lower expected production cost and gas prices. Little more information was released by Exxon Mobil at the time, but competitor Neon Energy had a slide for its annual general meeting in November 2011 as they were interested in drilling results of the same basin for their adjoining block 120. The well, 118-Ca Voi Xanh-3X well, was drilled by Seadrill West Aquarius (UDW semisub). “We are analyzing data from the well and evaluating our future business plans,” said the spokesperson. ExxonMobil also encountered hydrocarbons in the 118-Ca Voi Xanh-2X well, the second well in the exploration program. Drilling took place from July through August of last year. The first well in the exploration program, 118-Ca Voi Xanh, was drilled in May 2011 and did not encounter hydrocarbons. 4 years later, the recoverable gas had shrunk to 150 billion m3. 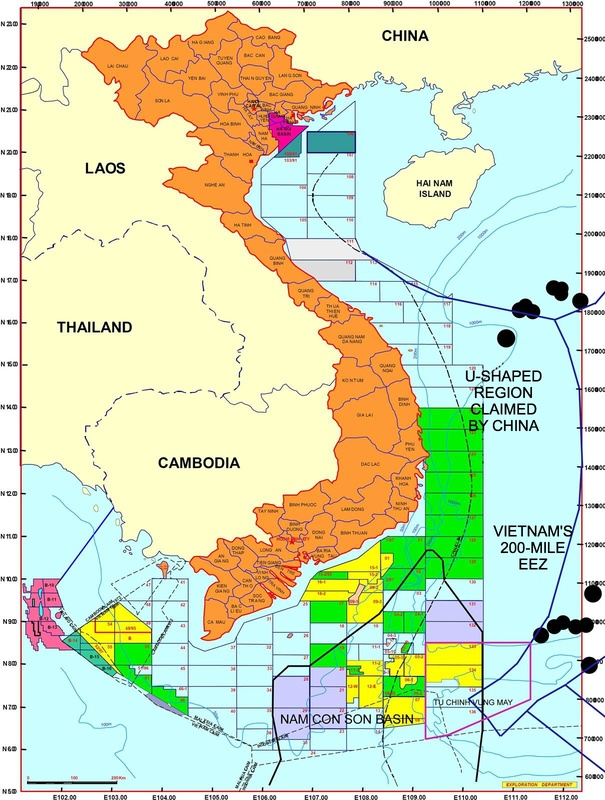 The Vietnamese government has just allowed US energy giant ExxonMobil to join in with the Vietnam National Oil and Gas Group (Petrovietnam) in Ca Voi Xanh, the largest gas field found so far in the East Sea. It is estimated that Ca Voi Xanh holds reserves of 150 billion cubic metres of natural gas, which is three times bigger than the combined reserves of the country’s two most productive gas fields, Lan Tay and Lan Do, in the southern Nam Con Son Basin. PM Nguyen Xuan Phuc recently approved construction of four gas-fired power plants with total capacity of 3,000 MW which will use gas from Ca Voi Xanh. According to their plan, PVN and ExxonMobil will produce the first gas from Ca Voi Xanh by 2021. It is hoped the field will produce about 10 billion cubic metres of natural gas a year. 3,000 MW would require some 3.6 bn m3 of gas pa. The location of the discovery in block 118 (Fig 9) seems to suggest it is very close to the 9-dash line while it is entirely within a 200 nm EEZ (exclusive economic zone, dark blue solid line). Let’s hope this problem can be resolved peacefully. We conclude by looking again at what Vietnam’s offshore gas is used for. The southern region must speed up delayed power projects to ensure sufficient energy supply and use cutting-edge technologies to reduce energy waste, experts have said. Recently, the government has given the go-ahead for more thermal plants in the Mekong Delta and gas-generated power plants in the central provinces of Quang Nam and Quang Ngãi. Vietnam’s electricity demand is expected to grow 13 percent annually in the next four years due to its fast-expanding economy. The US’ ExxonMobil Corporation is eager to exploit Ca Voi Xanh (Blue Whale) gas field stretching across the central provinces of Quang Nam and Quang Ngai to serve the power and petrochemical industries. At the recent meeting with Paul Greenwood, vice president for Americas, Africa and Asia Pacific Business Development at ExxonMobil Gas &, who is visiting Vietnam to study the feasibility of the Blue Whale gas field project, Deputy Prime Minister Trinh Dinh Dung highlighted the importance of the project for meeting increasing gas demands in Vietnam. Dung also urged ExxonMobil to work with Vietnamese state-run oil and gas group PetroVietnam and the Ministry of Industry and Trade to finalise the project. The exact amount of investment capital has not been released, but initial information suggested that the gas-to-power complex could cost as much as $20 billion, while PetroVietnam referred to a figure closer to $10 billion. However, according to the latest news, the project’s investment capital is $4.6 billion. ExxonMobil expects to exploit 8-9 billion cubic metres of gas per year, 1-3 billion cubic metres of which will go to Dung Quat Refinery for processing. So the numbers still keep changing. Given all the geopolitical problems, technical challenges and also financing limitations will there be first Exxon gas in 2021? Will it stop peak gas? Will power shortages continue? Good luck Vietnam.